By Richard Ross and Kevin Erickson There are many terms in the marine aquarium hobby that are used in multiple ways by different people, which can cause a great deal of confusion. This is especially true as it pertains to the origins and sustainability of animals – it is possible to purchase an animal thinking you know its background, lineage, where it comes from and how it was raised/collected, only to find out that you and the person you bought it from have a different understanding of what certain terms actually mean. Normally, as discussed in Skeptical Reefkeeping III, we would advise people to be aware of the different ways various people and businesses use or misuse terms, and to ask clarifying questions before you risk animals lives or your hard earned money. However, during the February 2012 MASNA Live panel discussion regarding, “Tank Bred vs Captive Raised” (Erickson, 2012), it became clear that there exist a suite of terms concerning the background and origin of marine aquarium organisms that are ambiguous. Even worse, there has yet to be any real effort to try to standardize these terms. If this situation is allowed to continue, the confusion and misuse, whether intentional or not, will continue, and skeptical reefkeepers will continue to shake their heads and say ‘I wish someone would do something about this.’ So, what follows is our attempt to take action. 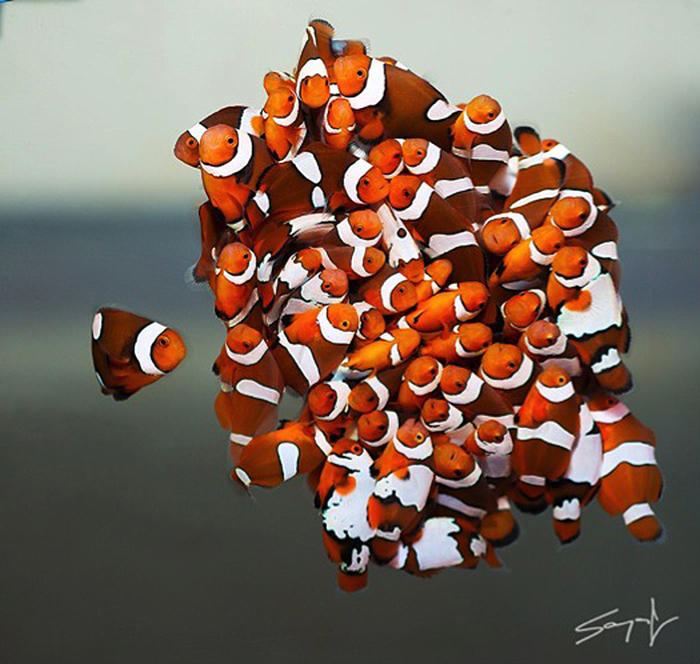 Designer clownfish are nearly all captive bred and as such are good for beginning hobbyists because wild reefs are not impacted by the learning curve. Photo by Sanjay Joshi. We have touched on this topic in the past, but in this installment of Skeptical Reefkeeping, we are going to explore some of these definitions as well as offer streamlined versions of terms which we think will help get everyone on the same page, avoid confusion, and help the hobby and industry communicate more easily and accurately about the animals in our care. A Brief Reminder to Set the Scene Skepticism is a method, not a position. Officially, it can be defined as a method of intellectual caution and suspended judgment. As a Skeptical Reefkeeper, you decide what is best for you, your animals, and your wallet based upon critical thinking: not just because you heard someone else say it. The goal of this series of articles is not to provide you with reef recipes or to tell you which ideas are flat out wrong or which products really do what they say they do or which claims or which expert to believe – the goal is to help you make those kinds of determinations for yourself while developing your saltwater expertise in the face of sometimes overwhelming conflicting advice. 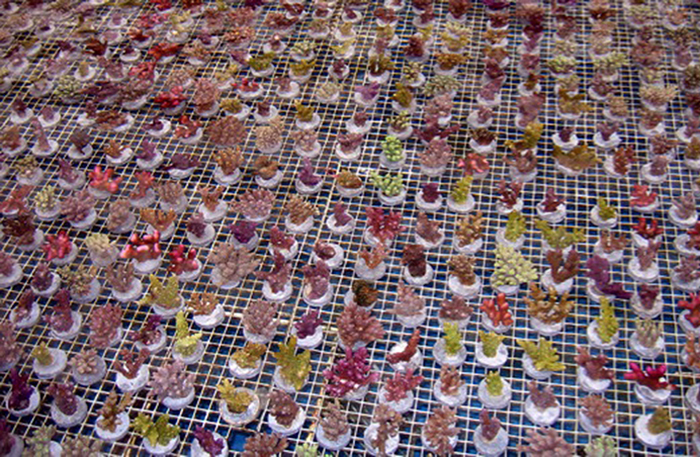 Our Goal and Process One thing that became clear during the MASNA Live panel discussion is that people have different ideas of how these terms should be defined, and trying to get a group of reefkeepers to agree on this kind of terminology is a bit like wanting people to agree on the best way to run a reef tank. We hope that the definitions offered below will at least reflect the underlying ideas of many different people. Our goal in this endeavor is to keep the definitions of terms simple and free of jargon, so that they are meaningful and easy to understand. Our hope is that anyone involved in any level of reefkeeping (or for that matter anyone not involved in reefkeeping) can easily understand what the terms actually and practically mean. Long, involved definitions are not only cumbersome, but seem to foster misuse and loopholes – which is exactly what we want to get away from. Captive bred Crested Oyster Gobies at home aquarium size, bred at the University of Florida. Photo by Matt Wittenrich. Organisms collected from the wild. This is one of the most straightforward terms, and there doesn’t seem to be any contention regarding its definition or use. The organism is taken directly from the wild and put in an aquarium. Such organisms may need conditioning to aquarium life and aquarium feeds, and should be quarantined, observed, and treated, if necessary, before being added to any existing population to avoid spreading infection and parasites. This currently seems to refer to the bulk of the animals in our hobby (Rhyne et al., 2012). 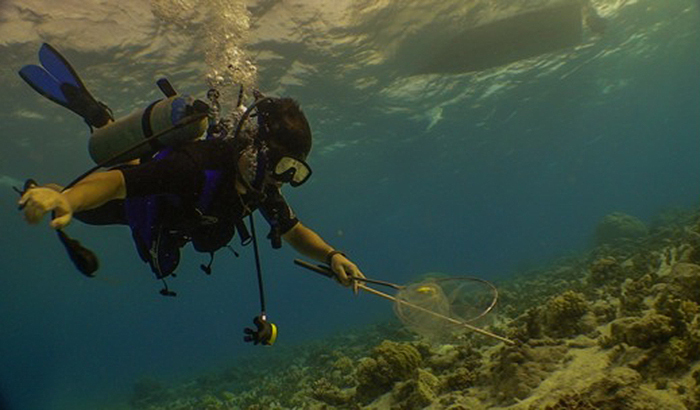 A fish collector in Kwajalein prepares to wild harvest some fish for the aquarium trade. Such collectors work hard and dive deep so that we can have a steady supply of quality animals for our aquariums. Photo by Richard Ross. Eggs or pre-settlement larvae collected in the wild, then grown or raised in tanks in facilities on land. Wild collected organisms kept in tanks, conditioned to eat commercial aquarium foods, and accustomed to tank conditions. This appears to be the most easily misused of our terms. Often, organisms are labeled as being tank / captive conditioned when they still haven’t acclimated to captivity, or when they have only been in aquaria for a limited amount of time, which doesn’t provide the benefits of captive conditioning. Organisms that have been properly captive conditioned provide a host of benefits over wild caught animals. 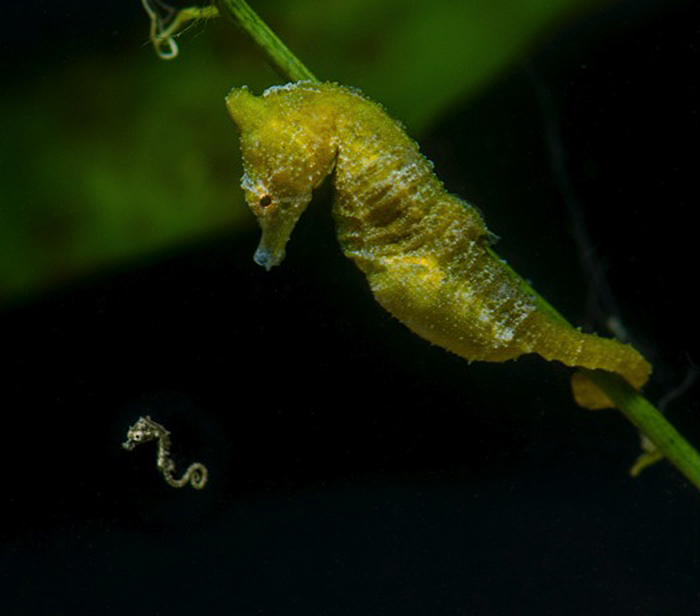 Besides being accustomed to aquarium life and foods, these animals have often gone through a quarantine and treatment regimen resulting in healthy animals with good body weight. Still, it is recommended that these animals be quarantined by their owners to further staunch any possible spread of disease. This baby H. zosterae is captive bred. It was born after its parents were observed spawning after months of being captive conditioned. Had it been born just after the adults were wild collected, it would be tank raised instead of captive bred. Photo by Richard Ross. Organisms that were spawned and raised in tanks / captivity in facilities on land. These organisms were not born in the wild, but instead were born in aquaria, or emerged from their parents in aquaria. They are accustomed to commercial food, are well acclimated to life in artificial environments, and typically are well suited for life in your tank simply because they have never lived in any other environment. It is recommended that these animals be quarantined by to further stop any possible spread of disease. 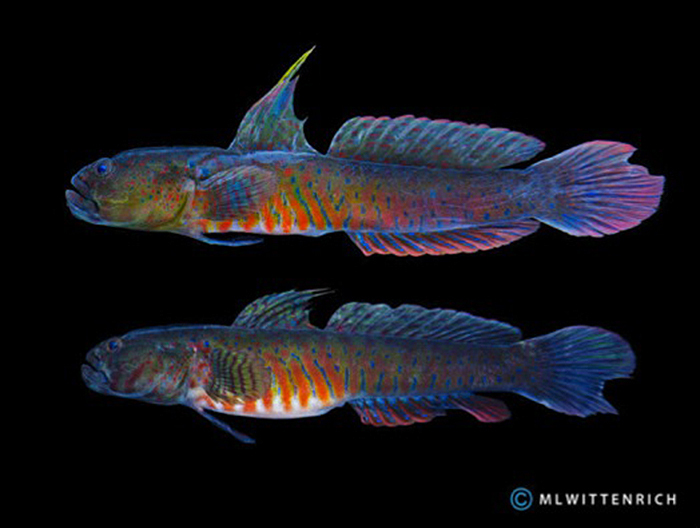 Developmental progress of Crested Oyster Gobies captive bred at the University of Florida. Research like this really highlights the difference between what goes into a true captive bred animal. Photo by Matt Wittenrich. Tank Bred / Captive Bred organisms are often thought to be the holy grail of animal acquisition as they have virtually no direct impact on wild populations. However, it is important to realize that in the bigger picture, wild collected organisms serve an important role in preserving wild habitats by giving local peoples an economic incentive to care for those environments. 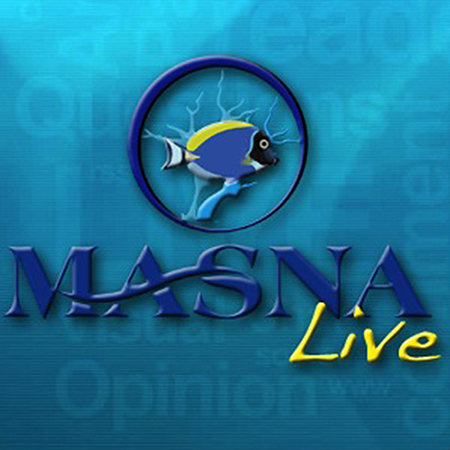 February 2012 MASNA Live episode: LSMAC, New BOD, “Tank Bred” panel, & Ret Talbot. Image care of MASNA. We have lumped all these together because the differences between the terms don’t seem to matter practically. Sure there may be technical differences between the terms, but the overarching similarity they all share is that the organisms were grown on purpose. All of these organisms should be quarantined and treated if necessary before introduction to captive populations to prevent the transmission of disease or parasites. 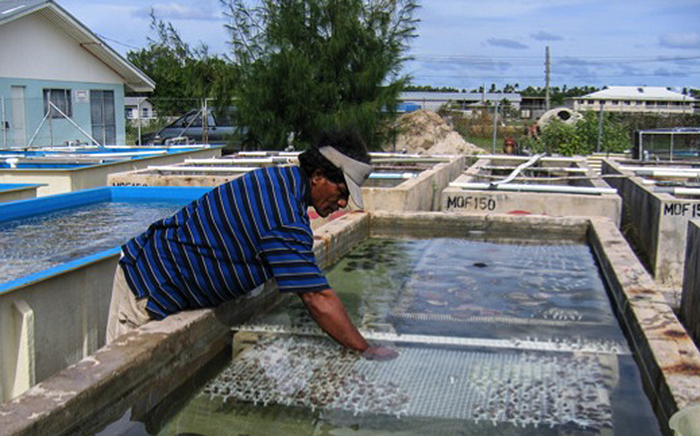 A technician at a Tongan Coral Farm places coral in concrete troughs for the long process of grow out. Such systems use pumped, unfiltered ocean water which is one of the factors that leads us to lump Maricultured / Aquacultured / Farmed / Cultured / Pen Raised / Net Raised organisms together in one category. Photo by Richard Ross. Recently cut fragments of organisms. Freshly Fragged organisms can be either wild collected or Captive grown. Freshly Fragged organisms may not do well due to stress from fragmentation and gluing. 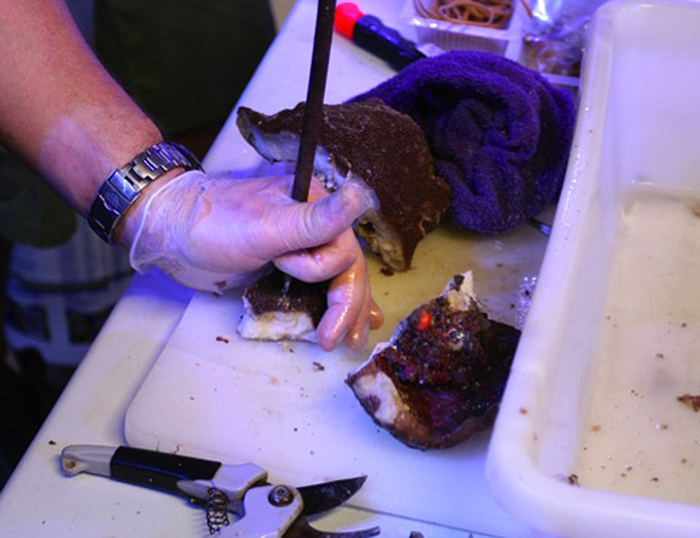 This practice has sometimes been referred to derogatorily as ‘chop shopping’ – wild colonies are chopped up, glued down and sold to customers who often believe that the corals have been in captivity for a significant amount of time. Both wild and captive grown freshly fragged organisms may suffer from the stress of fragmentation and gluing, while wild collected freshly fragged organisms have that stress compounded by the move from wild conditions to captive conditions. It is recommended that these organisms be quarantined and treated if necessary before being added to established systems. It is often possible to tell if a fragment has been freshly fragged by looking for exposed skeleton from where the coral was cut, or by the lack of encrustation onto the substrate to which the coral is glued. Freshly fragging of a wild collected coral with a hammer and large flathead screw driver. Photo by Kevin Erickson. Wild fragments of organisms that are fully healed prior to sale. These organisms, wild collected or not, are fragmented, but are allowed to stabilize, recover and grow resulting in corals that seem to adapt better to having their environment changed when they are moved to a new system. Though these organisms appear healthy, it is still important to quarantine and treat if necessary to prevent the spread of any coral diseases or parasites. Are these corals freshly fragged or healed? Only careful inspection of their attachment points for encrusting new growth will reveal the truth. Photo by Richard Ross. Organisms which contain no tissue / skeleton that was collected from the wild. These are typically frags of new growth from captive colonies (frags of frags) whose original origin was from the wild. 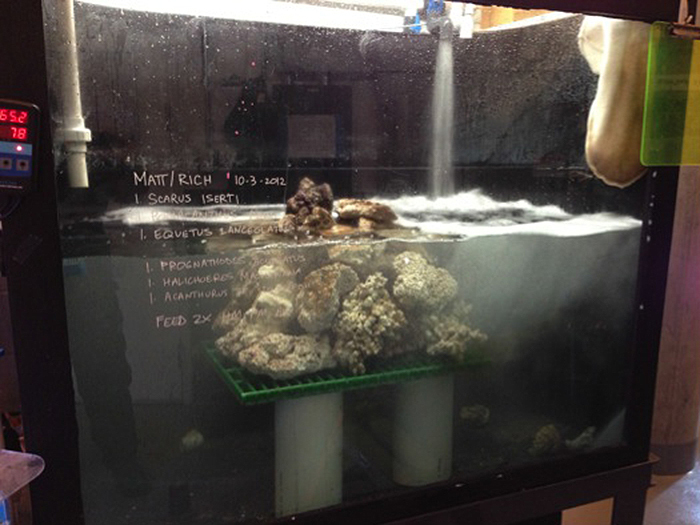 These corals typically do very well as they have been conditioned to tank life for a long time. And, as with every other definition in this article, these organisms should be quarantined and treated if necessary before being added to an established system. Quarantined (QT) You might also notice that the idea of quarantine is discussed in many of the definitions above. We could have had one general paragraph about quarantine, but we feel the issue is important enough to mention it over and over again. A common thought in the hobby is that captive bred or tank raised organisms are somehow disease or parasite free, but this is a dangerous viewpoint to embrace, and, like most ‘easy’ and erroneous beliefs in this complicated hobby, it can cost lives and money. 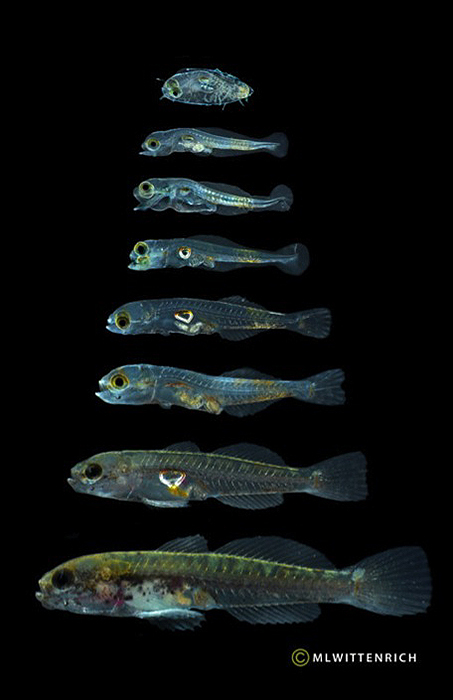 It is possible for animals kept en masse even in the cleanest of holding facilities to harbor unseen diseases and parasites despite the best efforts to eradicate them…and shipping stress caused by even the gentlest and most thoughtful shipping practices negatively impacts the organism’s immune system which makes it susceptible to diseases and pests. Even dormant and previously unseen pests and diseases carried by healthy-seeming organisms can manifest as a result of shipping stress. The short version of all of this: Regardless of where your animals come from, quarantine, and treatment if necessary, is mandatory before releasing organisms into their new home. Quarantine is important. This QT system at the Steinhart Aquarium is used for larger shipments of reef fish where all incoming fish are given a 30 day minimum QT regardless of their source. The rock island helps calm fish quickly and induces naturalistic behaviors making observation to determine if any treatment is needed much easier. QT set ups need not be this involved. Photo by Richard Ross.